Maybe it was the bison. Maybe it was the towering evergreens and tranquil lake. Or maybe it just felt like home. But when Mike and Amelia Sharpe first visited Northwest Trek to see if they wanted to get married there, the decision was instant. A big part of it was that the wildlife park felt like home. Native Washingtonians, Mike and Amelia both love the outdoors and connected instantly with the lush green forests, the peaceful meadows and snow-capped Mt. Rainier soaring just beyond. 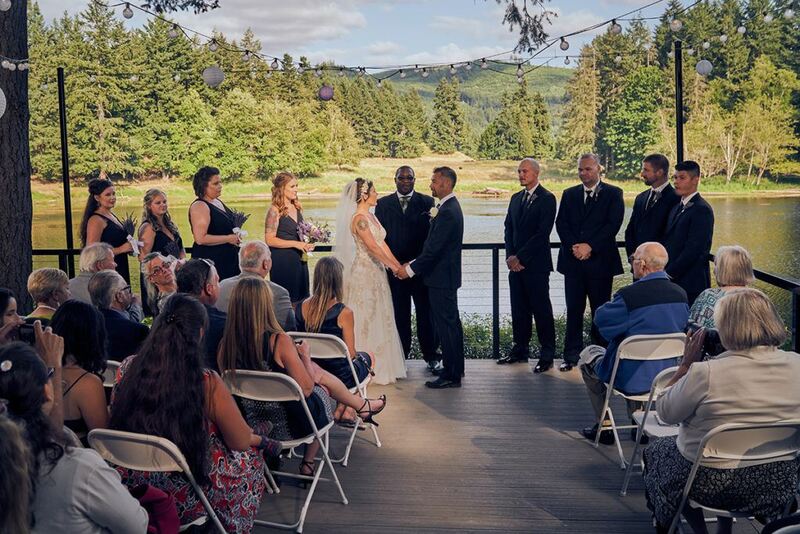 The log-cabin Hellyer Center, with its mid-century Northwest vibe and a view over the reflections of Horseshoe Lake, made the perfect place for a ceremony, with elk and bison visible on the shore. For Mike and his groomsmen, the day literally started in the treetops. 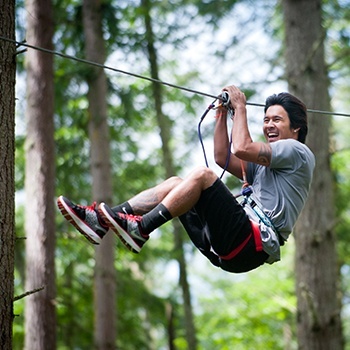 Arriving around 9 am, the men took an exhilarating turn through the Zip Wild Sensation Course, with its slacklines, 40-foot swing and hand-over-hand Tyrolean zipline. 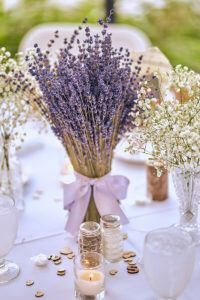 Northwest Trek event coordinator Joy Tevis then drove them over to the Hellyer Center to shower and change before they arranged all the flowers – deep purple lavender and baby’s breath, in thrift-store glass vases – for Amelia and her girlfriends. 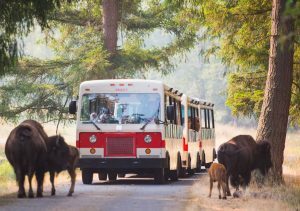 As the 60 guests arrived, they were taken by tram along the winding road around the Free-Roaming Area, meandering between herds of majestic elk, shaggy bison, bighorn sheep and elusive moose. The animals reappeared for a cameo later at the couple’s photo session in the keeper truck. At the Hellyer Center, Tevis and her helpers had strung lights through the trees for a magical twilight. 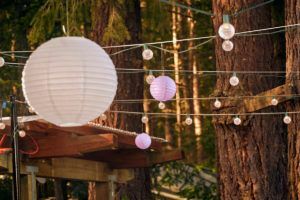 After an intimate ceremony that included special touches like wooden Washington magnets as guest gifts and a row of vintage German beer steins belonging to Mike’s Oma and Opa, the couple finally had the tranquil space all to themselves. 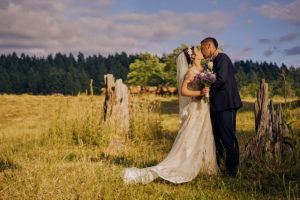 So perfect was their Northwest Trek wedding that the Sharpes, now living in Puyallup with their son Emmett, came back on a visit for their first anniversary – and are planning for their second. 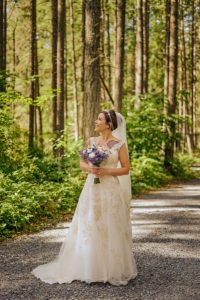 LEARN MORE about weddings at Northwest Trek.